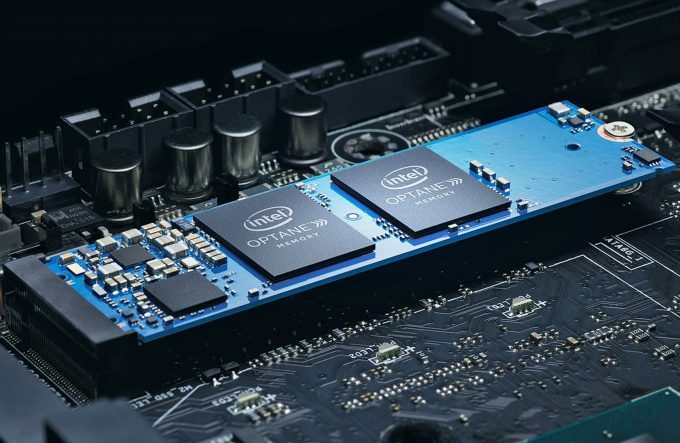 Last week, Intel announced the first Optane product that will launch for enterprise, the DC P4800X, but we now have confirmation of the consumer targeted device, Optane Memory. These are 16GB or 32GB M.2 SSD sticks featuring the 3D Xpoint technology that bridges storage and memory. Our previous news post covers the basics of 3D Xpoint, but in short, Optane is a new type of storage that merges the benefits of both memory and storage to form either high-storage-density memory, or ultra-fast storage, depending on how you look at it. 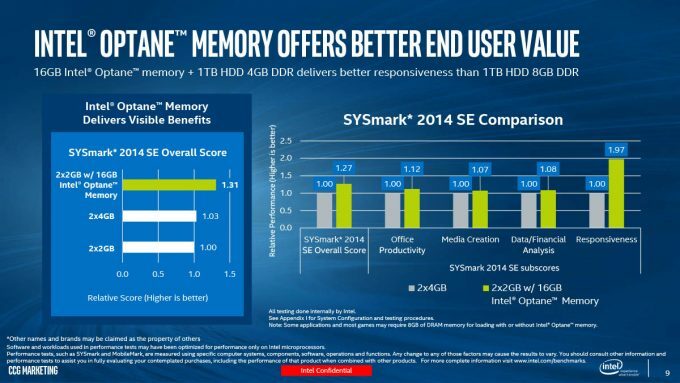 It’s faster than NAND flash in SSDs with good storage density, but not quite as fast as memory (DDR4). Initial product launches will be as a PCIe Add In Card (AIC) for enterprise, and an M.2 card for consumers, with a DIMM style product coming next year. Optane Memory is the M.2 card for consumers that works as a cache for slower storage devices, such as mechanical hard drives. Frequently used data will be saved to the Optane Memory module, and future access to that data is significantly sped up. If this all sounds like the older generation SSHD, or solid state hard drive, then you would be correct as this is effectively what Intel is doing. The main difference here is that the Optane Memory module is external from the HDD and thus can be upgraded, but also faster than normal NAND-based flash accessed over the SATA interface. Intel provided many different workload tests which showed the significant improvements to things such as application launching and boot times, when compared to a standard HDD. 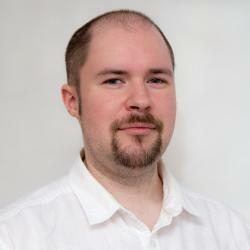 The problem though, is a lack of detail for anything relating to existing SSD solutions. Intel’s target market seems to be more geared towards the less technically inclined user base; people who don’t know about SSDs or how to manage multiple storage devices – as this is one of the key components of the setup. The Optane module is transparent to the user, as it’s combined with the main storage device using Intel’s Rapid Storage Technology (RST). All the caching happens in the background without the user knowing its even there, eliminating the need to put the main OS on one drive and games/applications on another. Enthusiast and prosumer users will likely opt for an SSD as a boot device, either as SATA-based or more performant M.2 PCIe NVMe, such as the Samsung 960 Pro. With such setups, it’s unknown as to the effect of the Optane Memory module, at least until testing can begin. Users with only a mechanical HDD will see major benefits once key applications and the OS have been cached. Prices for the M.2 Optane Memory modules are around $50 for 16GB, and around $75 for the 32GB module, which does seem rather steep compared to a normal SSD when you take density into account (the same price as a 256GB SATA SSD). As said before though, it’s the transparent integration with the system that will be the main benefit. However, a question is raised with regard to a hybrid system of all three storage devices, Optane, SSD and HDD. Most enthusiasts will have an SSD for the OS, key applications and maybe some games. Other games will be stored on a much larger hard drive which may still be accessed on a frequent basis. Could the Optane module be configured to only cache the HDD and leave the SSD alone? That’s something we’ll have to wait and see. Optane by itself is significantly faster than NAND-based SSDs, especially at low queue depths, at least with SATA-based SSDs. NVMe SSD are not likely to see such huge performance gains, but since most motherboards only have room for single M.2 port, you will have to decide on whether to get Optane and SATA SSD, or an M.2 NVMe SSD. 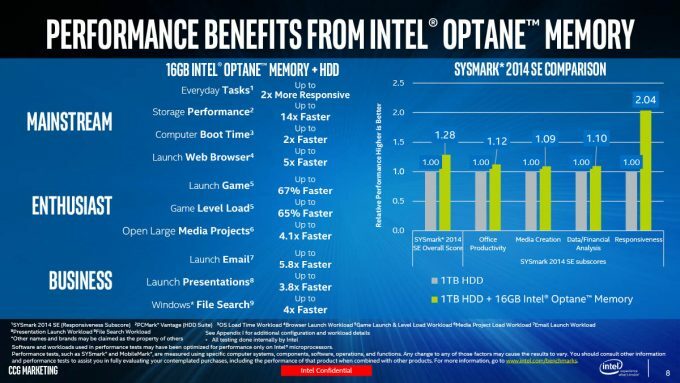 This is not to say that Optane will be useless in the enthusiast market, as this is really only the first step. Looking at the enterprise market though with the DC P4800X, Optane makes a lot more sense. The DIMM style modules are where things get very interesting, with the possibility of instant-on devices becoming a real possibility (well, if you exclude POST). Currently, Intel will only be supporting Optane on its latest Kaby Lake processors and matching modern motherboards (Z270, Q270, H270, Q250 and B250), with the 16 and 32GB Optane Memory modules shipping April 24.